The martial art called "Escrima", at its core, has developed from the ancient art of sword fighting which evolved as far back as the stone ages. Centuries ago, the people of the Philippines used highly developed sword fighting skills and weapons such as the Kris, Bolo and Kampilan to defend themselves against Spanish conquistadors. Though the filipino fighters were defeated, the Spanish were impressed enough with their sword techniques that they named this fighting style "Escrima" and its fighters "Escrimadors". During this following period of Spanish colonization, the practise of Escrima was outlawed. 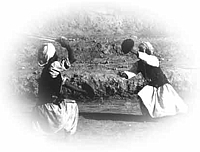 In order to carry on the techniques and tradition of this martial art, the villagers incorporated its methods, movements and techniques into dances, with sticks or empty hands replacing the swords. Many important techniques were preserved through this incorporation and remain an integral part of Escrima practice today, such as corto mano (short distance combat), larga mano (long distance combat), stilo de elastico and moro (very powerful low fighting styles), stilo de escapo (escape style), and stilo de abaniko corto (short twisting style) Escrima today has developed from a complex combination of fighting with blades, with sticks and with empty hands. Unlike many other martial arts; the knowledge and experience of Escrima is not just for practicing in the classroom or in kung-fu movies: nor is it simply a ceremonial/ stylised artifact. Though it is based an medieval Asian fighting techniques, its practice is completely relevant and benefitial within the context of modern daily life, in terms of improved coordination, greater body awareness and confidence, greater mental and physical focus, emotional/ energy control, situational judgement and stress control, great potential for real self-defence using natural not stylized techniques and movement, and improved general fitness. My philosophy is to develop a strong mind as well as strong fighting ability.When these are in balance and both very well developed, FIGHTING HANDS can become HEALING HANDS. A good martial artist should always be a positive Support to their community.